Acapela Group » Voice-first interfaces at CES 2018: Test and hear personalized voices for autonomous vehicles, smart toys and IoT from Acapela Group. Voice-first interfaces at CES 2018: Test and hear personalized voices for autonomous vehicles, smart toys and IoT from Acapela Group. Voice first interfaces are reinventing the way we engage with devices. Acapela Group, leading player in voice solutions for more than 30 years, is constantly creating new voices to better interact with users, whatever their age or skills, thanks to voices that adapt to the context. Voices that convey meaning, intent and emotions. Voices for smarts toys, IoT, DIY Animation software and autonomous vehicle: test them all at CES! Voices for smart toys and IoT – Test smart talking toys. Speech is the most natural interface for objects that think, communicate and store information. Children naturally voice-interact with smart toys that answer their questions, play games, spell, tell jokes. Voice-enabled toys effectively support creative development, encourage imagination, learning and playing and get smarter over time via machine learning. The Internet of Things simplifies your daily life from the smart fridge to light bulbs and basically any connected device that, combined with Internet connectivity and powerful data analytics, promises to transform the way we work, live and play. Stop by booth Westgate #1601 at CES to hear more about our voice solutions for smart toys and IoT and test some smart devices -from Cognitoys, Chappet, Emotix, Cai Media- that are already using our voices, play with Acapela voices on Plotagon’s DIY animation software or Control home devices with the Snips solution. Voices for Urban Mobility – Get on board the first robo-taxi! We are very pleased to be onboard the NAVYA AUTONOM CAB, the first robo-taxi on the market presented at CES 2018. Don’t miss the opportunity to have a talking ride on board the AUTONOM CAB during the CES (North Plaza-Gold Lot #NP-9). Voice technologies are the natural and seamless interface to accompany this new mobility age, which combines environmental benefits and improved safety. Acapela voices are contributing to making the journey safe and pleasant with personalized and pleasant audio information from departure to arrival. 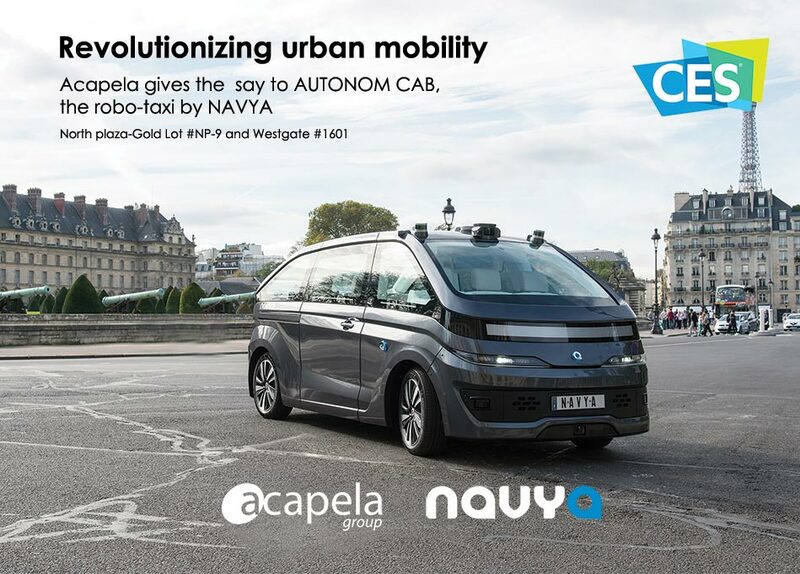 Listen to Acapela’s new voice on the AUTONOM CAB, the robo-taxi by NAVYA! More about Acapela Group: Voice First: Use personalized voices! Our Text-to-speech solutions give the say to tiny toys, robots, autonomous vehicles, smartphones, IoT and much more. We create personalized voices that read, inform, explain, present, guide, educate, tell stories, help to communicate, alarm, notify, entertain.